The first Arianespace mission in 2018 has been given the “green light” for its January 25 liftoff following today’s successful launch readiness review, which was conducted at the Spaceport in French Guiana. This milestone confirmed that the Ariane 5 launcher and its dual-satellite payload – consisting of SES-14 and Al Yah 3 – are flight-ready, along with the Spaceport’s infrastructure and the network of downrange tracking stations. With approval granted, Ariane 5 is cleared for rollout tomorrow from the Final Assembly Building to the ELA-3 launch zone – where it will be readied for liftoff on Thursday during a 45-minute launch window that opens at 7:20 p.m. local time in French Guiana. The launch vehicle is supplied to Arianespace by ArianeGroup as production prime contractor. Arianespace is orbiting SES-14 for Luxembourg-based telecommunications satellite operator SES. This Airbus Defence and Space-produced spacecraft – based on the E3000 EOR (Electric Orbit Raising) version of the Eurostar E3000 platform – will serve Latin America, the Caribbean, North America and the North Atlantic region with its C- and Ku-band wide beam coverage, as well as Ku-band high-throughput spot beams coverage. SES-14 also has a NASA-funded hosted payload for the Global-scale Observations of the Limb and Disk (GOLD) mission, which is to deepen scientists’ understanding of the nearest reaches of space by providing unprecedented imaging of the Earth’s upper atmosphere from geostationary orbit. The SES-14 satellite is in Ariane 5’s upper payload position, to be released first at 27 minutes into the mission. Al Yah 3 will be operated by Yahsat, which is located in the United Arab Emirates at Abu Dhabi. 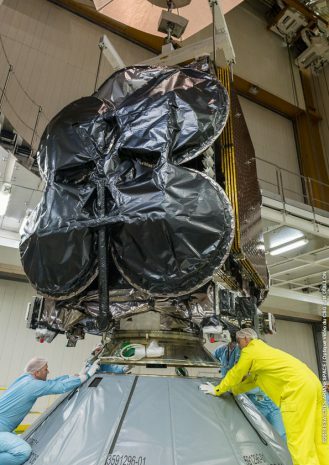 Once in orbit, the all-Ka-band spacecraft – built by Orbital ATK using its new GEOStar-3 hybrid platform – will provide affordable broadband communications to 60 percent of Africa’s population and more than 95 percent of Brazil’s population. 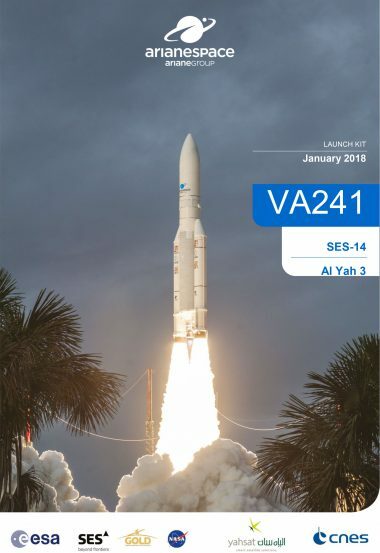 As the lower payload on Ariane 5, Al Yah 3 is to be deployed by Ariane 5 at 35 minutes after liftoff. The January 25 mission is designated VA241, denoting the 241st flight using an Ariane vehicle since this European series of launchers entered service in 1979. It opens a busy year of activity for Arianespace, which will perform as many as 14 missions in 2018 with its full launcher family – consisting of the heavy-lift Ariane 5, medium-lift Soyuz and lightweight Vega. on January 25 Between 5:20 p.m.
23:05 on January 25 Between 11:20 p.m.